Lupus nephritis is a kidney disorder or inflammation caused by systemic lupus erythematosus (SLE or lupus). SLE is a chronic autoimmune disease in which the body’s immune system becomes damaged and attacks the patient’s own cells and tissues. Lupus nephritis occurs when SLE involves the kidneys. What is the cause of SLE? The underlying cause of SLE is not fully known. Many factors may play a role. These include genetic, environmental and hormonal factors. SLE is most common in woman ages 20 to 40 years old. 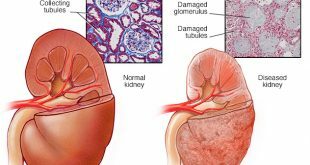 About 50-60% of patients with SLE develop lupus nephritis within the first six months to three years of SLE being diagnosed. On the other hand, some patients may not have any symptoms of SLE when they are diagnosed with lupus nephritis. What are the symptoms of SLE and lupus nephritis? Body-swelling especially around the eyes, legs, ankles, or fingers. However, some people with SLE have no obvious symptoms of kidney disease. In this circumstance, the diagnosis is made by blood and urine tests. When the kidneys are inflamed, they do not function normally and can leak protein. If they are not treated, lupus nephritis can lead to kidney failure. The diagnosis of lupus nephritis begins with a thorough medical history and physical examination. Your doctor will order special tests to confirm the diagnosis. Urine tests – The presence of blood and protein in the urine is a sign of on-going kidney inflammation/damage. Blood tests – The kidneys remove waste materials such as creatinine and urea from the blood. High blood levels of urea and creatinine indicate that kidney function is declining. Your doctor should estimate the level of your kidney function based on the blood Additional tests to measure various auto-antibody levels and markers of inflammation will assist the doctor to diagnose and monitor the disease activity. Imaging tests – For example,ultrasound of the kidneys and the urinary tract. What is the treatment of lupus nephritis? The treatment of lupus nephritis is based on its type/class, which is determined from the kidney biopsy. There are six classes of lupus nephritis, class 1 to VI. Since symptoms and severity vary from person to person, treatment is individually tailored. The goal of treatment is to halt the inflammation in the kidneys and improve kidney function. The treatment usually involves medications that reduce inflammation and suppress the deranged hyperactive immune system. Medicines may include corticosteroids or other medications that suppress the immune system, such as Cyclophosphamide, Cyclosporine A Mycophenolate, or Azathioprine. Corticosteroids, such as prednisolone are commonly used as the initial treatment for lupus nephritis. The steroids may be given orally or intravenously. Also, high-dose intravenous corticosteroids (methylprednisolone) for three consecutive days are also a useful initial treatment for severe lupus nephritis and is then followed by corticosteroids by mouth. Other immunosuppressive medications used to treating lupus nephritis include Cyclophosphamide and Azathioprine (Imuran®). Cyclophosphamide is usually given as an intravenous, single large dose (pulse). These pulses are continued monthly for six months. Cyclophosphamide can also be taken orally for a short period. Mycophenolate Mofetil has also been used successfully to treat lupus nephritis. In general, treatment results incomplete/partial disease remission in the majority of cases (80%). A number remain in stable non-remission and a small number of patients progress to end-stage kidney disease. Even in these patients whose lupus nephritis remit, regular follow-up is important as this disease may flare or relapse and require treatment. Hence, it is very important for patients to take medication and other measures as prescribed to prevent relapse. Can lupus nephritis be prevented? There is no known prevention for lupus nephritis. However, patients with SLE must be compliant with their treatment.